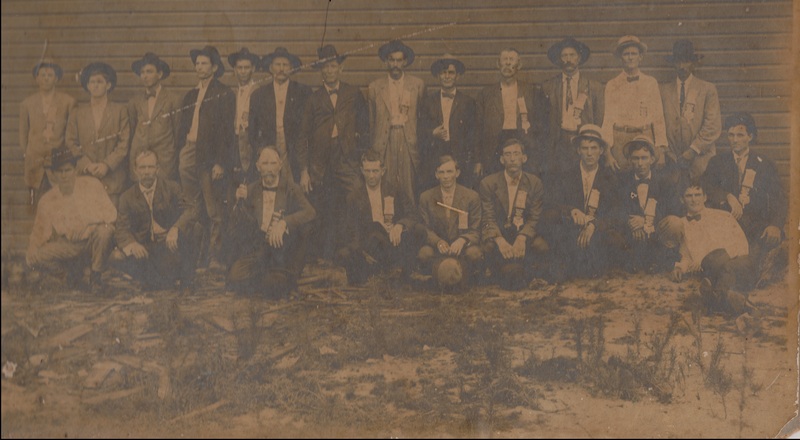 Walter Howard Knight, photographed at Beaver Dam Baptist Church (now known as Ray City Baptist Church), Ray City, GA.
Walter Howard Knight, a son of William Washington Knight (1829 – 1863) and Mary E Carroll (1839 – 1906), is the only identified individual in the photo above. He was born November 28, 1859 in Berrien Co., GA and died June 13, 1934. 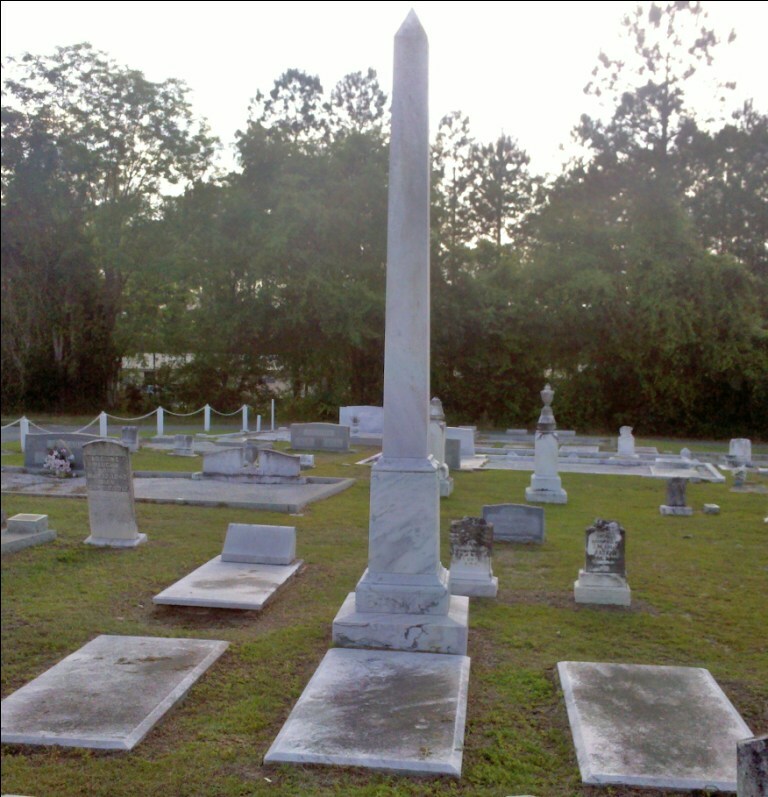 Walter Howard Knight is buried at Beaver Dam Cemetery, Ray City, GA. 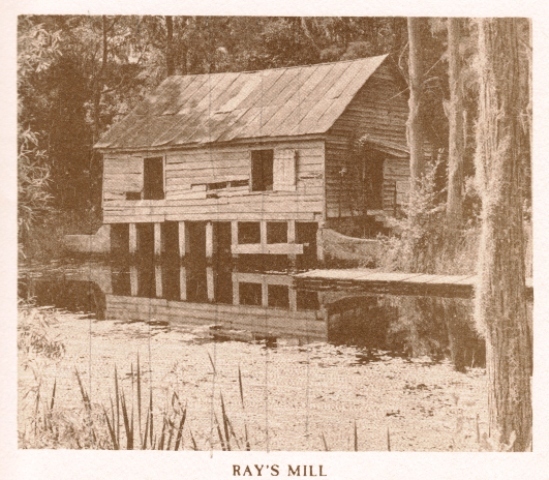 In 1874 when Mercer Association missionary Reverend J. D. Evans came to Ray’s Mill, GA Thomas M. Ray was deeply moved by the Baptist’s message. Thomas M. Ray must have attended the church meetings in the old log school house and the big revivals that were held in May and July, 1874, for he became instrumental in the formation of a Baptist Church at Ray’s Mill. On September 20, 1874 a small group of followers met with Reverend J. D. Evans at the home of Thomas and Mary Ray to organize the Beaver Dam church. Thomas M. Ray. and David J. McGee were elected to represent the new church to the Mercer Baptist Association and were sent as messengers to the Valdosta Church. The Reverend J. D. Evans wrote a petitionary letter which they carried to the association. In November 1874 Thomas M. Ray was appointed to a church building committee along with James M. Baskin and David J. McGee. He served on the committed that selected and procured the site for the construction of the church building. He continued to serve on the building committee until his death. The original wooden church building at Beaver Dam was constructed by W.A. Bridges and James M. Baskin (see Baskin Family Helped Found Ray City Baptist Church). Construction began in January of 1875. Baskin and Bridges hand hewed the timbers to frame the church. Sawn lumber were purchased but had to be dressed by hand. The building was finished with windows and siding. The pulpit, table and pews were all built on site. J.M. Baskin made the doors himself. 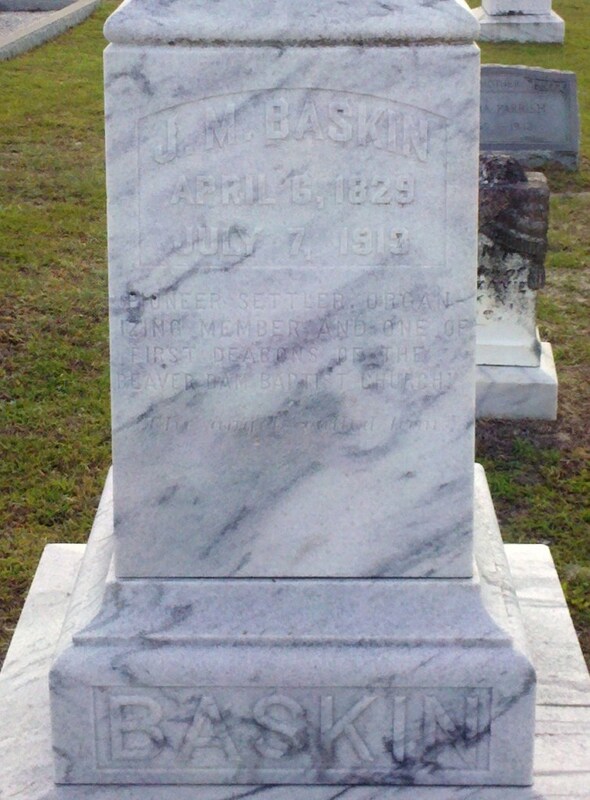 Baskin monument, Beaver Dam Cemetery, Ray City, GA.
Frances Bell and James Madison Baskin were among the pioneer families that settled in the Ray City, GA area. Frances was a member of the Troupville Baptist Church (now the First Baptist Church of Valdosta). 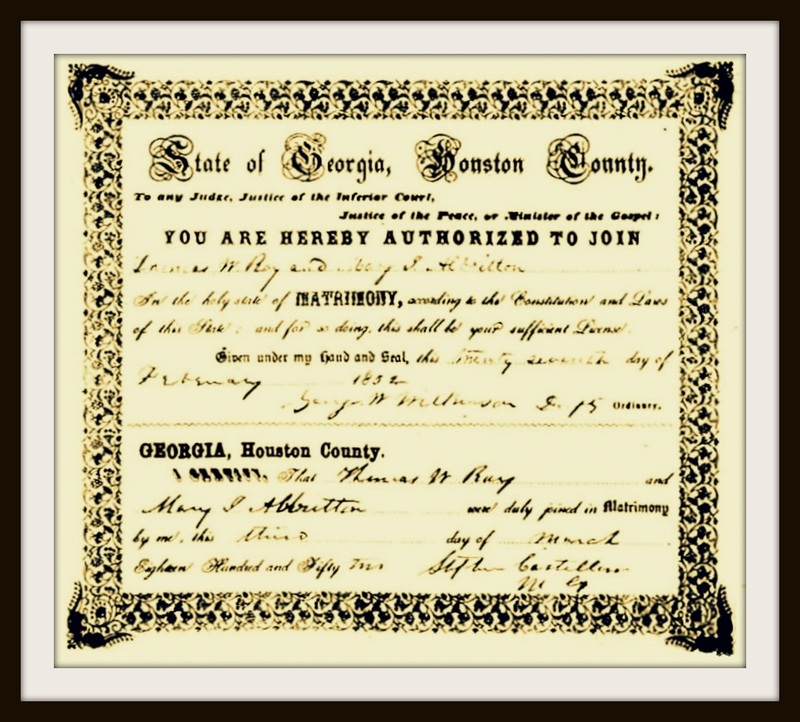 After the New Bethel Church, Lowndes County, was organized 1871, Frances and James were united with it. Three of their daughters, Georgia Ann Baskin, Martha J. Baskin, and Sarah E. Baskin were among founding members of Beaverdam Church who met in the home of Mary and Thomas M. Ray, Sr. with Reverend J. D. Evans on September 20, 1874 to organize the church. While the minutes of that September meeting do not show their father, James Madison Baskin, present at the organizational meeting, he is listed on the plaque honoring charter members along with W.A. Bridges. James and Frances remained members of the Ray City church for life. In October 1874 J.M. Baskin was elected first deacon of the church , becoming ordained on March 21, 1875. He served on the committee that selected and procured the site for the construction of the church building. According to notes written by Mary A. Ray, James M. Baskin and W.A. Bridges were the builders of the church building. Construction began in January of 1875. Baskin and Bridges hand hewed out all the timber to frame the church. Windows and sawn lumber were purchased but had to be dressed by hand. The pulpit, table and pews were all built on site. J.M. Baskin made the doors himself. He continued to serve as a deacon of the church until 1903 when dismissed by letter. 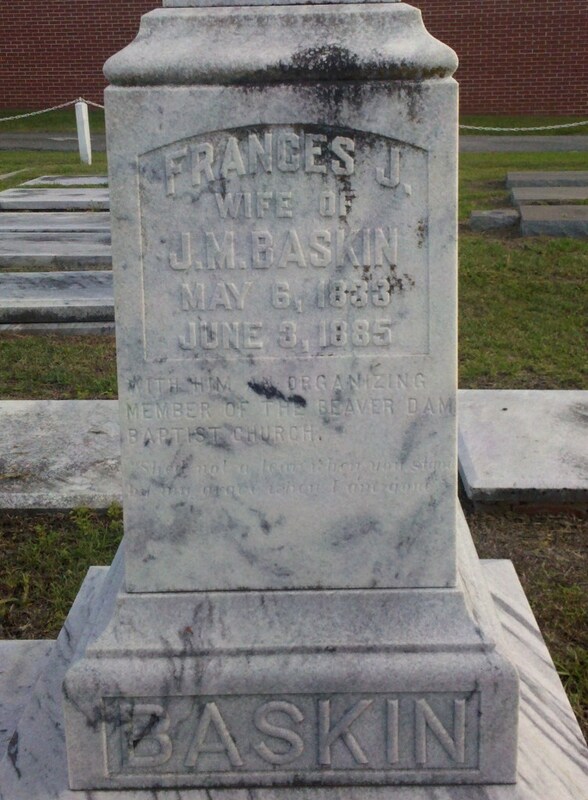 Frances Bell Baskin died on June 3, 1885 in Rays Mill, Berrien County, Georgia. James Baskin was a widower, 56 years old, the youngest of his 11 children just 9 years old. He decided to re-marry. Just six months later, on Dec 30 1885 he married Mary Ann Harrell. She was a native of Lowndes County, born in Nov. 29, 1859. At 27, she was a prominent citizen experienced in public service, and a former Ordinary (probate judge) of Lowndes county. This union produced six children. James Madison Baskin lived on his land near Ray City with his second wife until his death on July 7, 1913 . 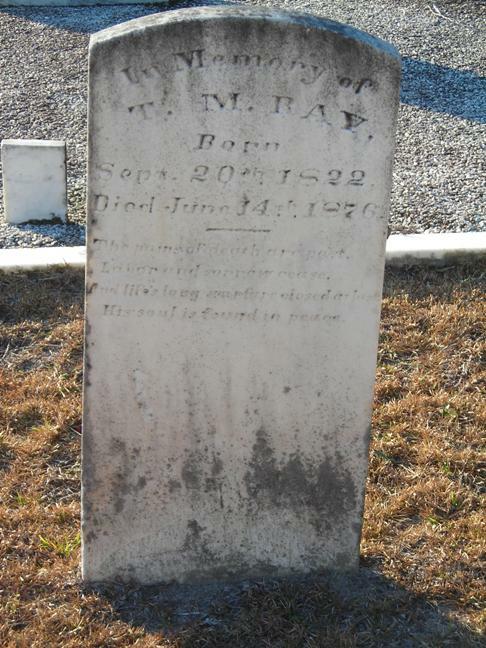 He and both of his wives are buried at Beaver Dam Cemetery in Ray City. 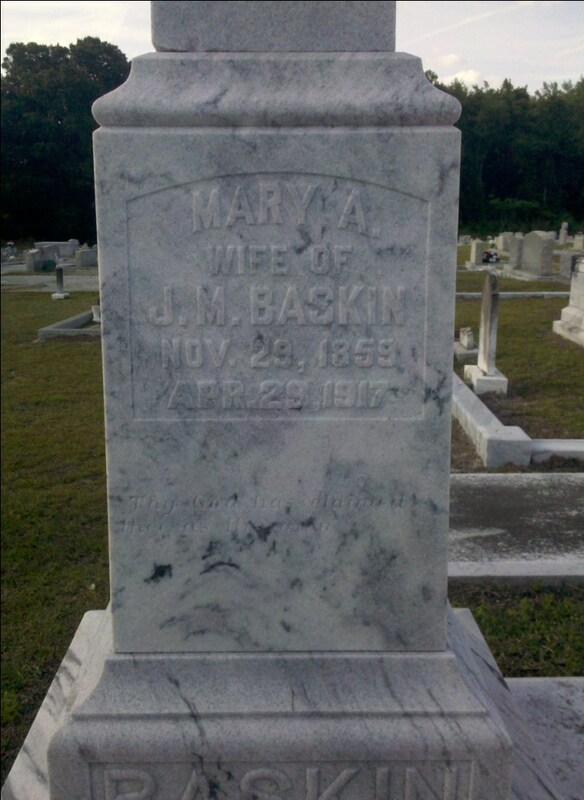 Gravemarker of Mary A. Baskin, Beaver Dam Cemetery, Ray City, GA. The graves of James Madison Baskin (1829-1913) and his two wives, Frances J. Baskin (1833-1885) and Mary A. Baskin (1859-1917). 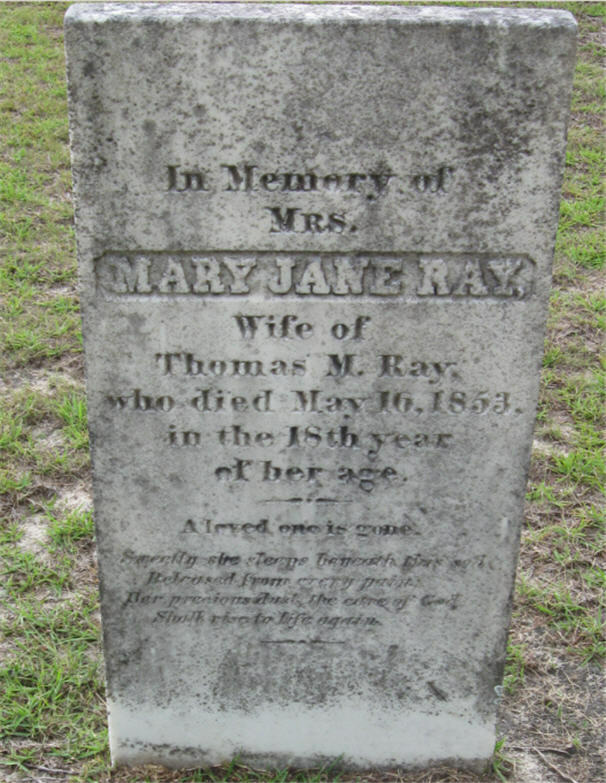 Beaver Dam Cemetery, Ray City, GA.